Human chromosome 3 pair after G-banding. One is from mother, one is from father. Chromosome 3 pair in human male karyogram. 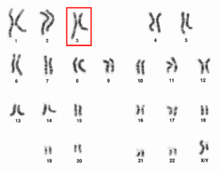 Ideogram of human chromosome 3. Mbp means mega base pair. See locus for other notation. Chromosome 3 is one of the 23 pairs of chromosomes in humans. People normally have two copies of this chromosome. Chromosome 3 spans almost 200 million base pairs (the building material of DNA) and represents about 6.5 percent of the total DNA in cells. Identifying genes on each chromosome is an active area of genetic research. Because researchers use different approaches to predict the number of genes on each chromosome, the estimated number of genes varies. Chromosome 3 likely contains between 1,100 and 1,500 genes. C3orf14-Chromosome 3 open reading frame 14: predicted DNA binding protein. Wikimedia Commons has media related to Human chromosome 3.